For information on using the newer form of integration, see Using Unstructured Data in Cubes in the Advanced DeepSee Modeling Guide. This section provides an overview of the older, deprecated form of integration between iKnow and DeepSee cubes. DeepSee is an analytics engine and reporting platform that is built into Caché in the same way that iKnow is. The primary purpose of DeepSee is to enable you to create interactive dashboards that you can embed on Zen pages or that users can access via the DeepSee User Portal (which is intended for all end users, not just end users of DeepSee). A DeepSee cube is a data model that enables you to create DeepSee queries by drag and drop actions. The queries are known as pivot tables. You create pivot tables so that you can display them on DeepSee dashboards. When the dashboard is displayed, the query is executed. Each cube is based on a source table. You build a cube, and this process generates a fact table that has the same number of records as the source table (or possibly fewer if the model skips some records deliberately). 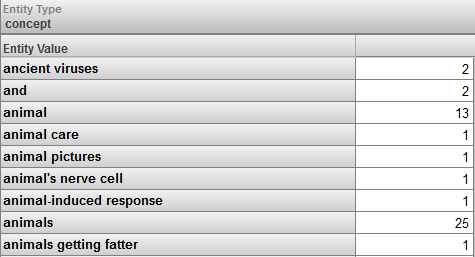 The queries use the fact table rather than the source table. DeepSee provides multiple complementary mechanisms to keep the fact table synchronized with the source table. The following figure shows an example pivot table that shows the number of patients and the average allergy count per patient, grouped by age and gender. A level is used to group the records. In this case, we are grouping patients. Each record in the source table corresponds to one patient, as does each record in the fact table. A measure is a value displayed in the body of the pivot table. It is based on values ultimately taken from the source data. For a given context, a measure aggregates the values for all applicable records and represents them with a single value (typically by summing them). A cube can also define detail listings, whose purpose is to display lowest-level data associated with the current context. To access a listing, you select one or more cells and click the Listing button (not shown in the previous picture). DeepSee then displays a table that lists selected fields for all the records used in the current context. The goal is to be able to use DeepSee and iKnow filters interchangeably where possible. 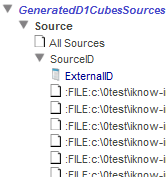 If a DeepSee cube uses a source class that includes a reference to iKnow data source, you can use the levels of that cube as iKnow source metadata fields for those sources. This means that you can use DeepSee filters within iKnow queries (including when you access those queries via the DeepSee KPI mechanism as described in Using Unstructured Data in Cubes in the Advanced DeepSee Modeling Guide). This section assumes that the cube is defined and has been built. The cube does not need to be modified or rebuilt. When you do so, make sure that the external ID of each source can be readily associated with a specific record of the source class of the cube. If you are using a file lister, you might make sure that the file names match the patient identifiers. If you are using an SQL lister, you might make sure that the IDs of the records match the patient identifiers. Make sure that the source class of the cube includes a property whose value is the external ID of the corresponding iKnow source. For example, this class could include a calculated property whose value follows the naming convention established in the preceding step. domainId is the integer ID of an iKnow domain. cubeClassName is the name of the cube class. levels controls which levels are processed. If you omit this argument, the system processes all levels, skipping the ones that are not supported by the iKnow engine. arrayname(level_name) where level_name is the complete MDX identifier of the level, in double quotes. For example: "[DocD].[H1]. [Doctor]" Either 0 or 1. If you specify 1, the iKnow metadata field is generated as a bitstring, which is suitable when you expect only a small number of values. More generally, extIdProperty is a property (in the cube’s source class) whose value equals the external ID of an iKnow source in the given domain. killExistingMDFields specifies whether to remove any existing iKnow metadata fields. If you also create iKnow KPIs in this domain, then you can use DeepSee filters in the KPI, provided that the KPI and the cube are both associated with the same iKnow domain. Display the KPI in a widget on a dashboard. In the DeepSee Analyzer, create a pivot table. On the same dashboard, add a widget that displays the pivot table. Configure this widget to use one or more levels of the cube as filters, and specify the filter target as * (all widgets). This release provides a preliminary version of a utility that generates DeepSee cubes from iKnow engine results. 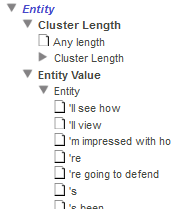 The generated cubes enable you to view entities, entity occurrences, and match results grouped in various ways. With a DeepSee cube, you can perform analysis and exploration via drag and drop actions in the DeepSee Analyzer. You can use these DeepSee cubes in the same way that you use other DeepSee cubes; you can explore them in the Analyzer, create pivot tables, and add those pivot tables to DeepSee dashboards. 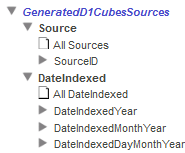 If you can achieve a required result through an existing iKnow query, use that query rather than trying to create an equivalent query with the generated cubes. The iKnow queries are optimized to use internal and precalculated indices and are faster as a consequence. packageName is the package in which to place the generated classes. 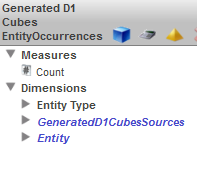 If createCube is 0, the system generates and compiles the classes on which the cubes are based, but does not generate other classes. You might use this option if you wanted to create DeepSee cubes manually in the DeepSee Architect. These classes define mappings to access the iKnow data. If createCube is 1, Caché also generates and compiles a cube that represents the iKnow sources. If createCube is 2, Caché also generates and compiles a cube that represents unique entities, and another cube that represents entity occurrences. If createCube is 3, Caché also generates and compiles a cube that represents matching results. overwriteExisting specifies whether to overwrite any existing classes. buildCubes specifies whether to build the generated cubes. This has no effect if createCube is 0. The phrase build a cube refers to the process of populating the structures that the cube uses. This process makes it possible to use the cube. Click the Change button . This cube defines one measure, Count, which counts entity occurrences. This measure is used by default. The area at the bottom is a simple pivot table. It displays the total value for Count. In this example, there are 7118 entity occurrences in the domain. Drag concept and drop it into the Filters box on the right. This immediately updates the display. Rebuild the sources cube, which is the cube whose name ends in Sources. Rebuild the other cubes, in any order. To rebuild a cube, open it in the Architect and click Rebuild. For information on the DeepSee Architect, see Creating DeepSee Models.